Repeat that a few dozen times and you’ve got the entire conversation between Mr. History Tourist and me, as we drove into Arches National Park, five miles north of Moab, Utah. We’d passed some pretty spectacular John Ford scenery the evening before, driving from Hovenweep to Moab. But we didn’t really know the meaning of spectacular until we got to Arches. I’m going to share some photos with you, but understand that they, in no way, convey just how jaw dropping the scenery is. Our first stop, just to get our legs going, was “Park Avenue,” an easy, two mile, out and back trail through a canyon. It’s the first major trail along the park’s scenic road, 2.5 miles past the Visitor Center. 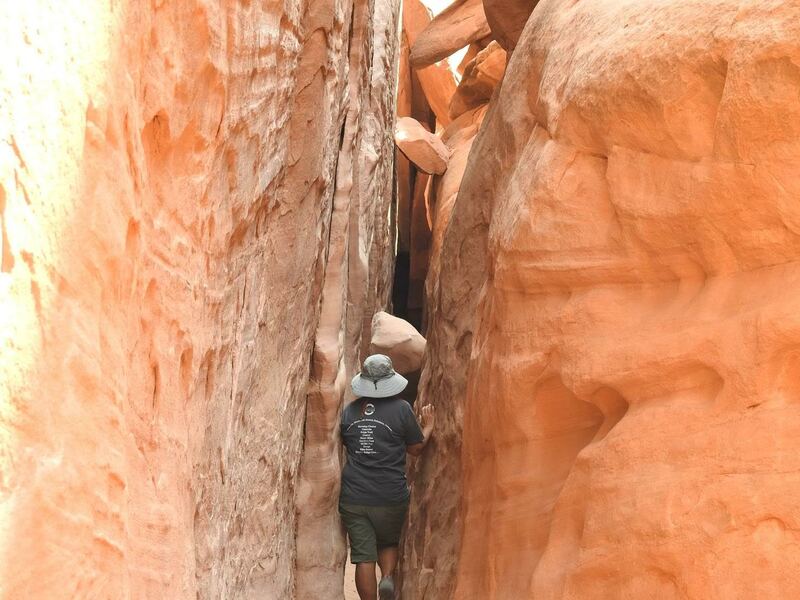 Over the last two million years, cracks in the sandstone covering the area eroded and formed these “fins.” They are, explained the sign at the beginning of the trail, the first step in arch formation. 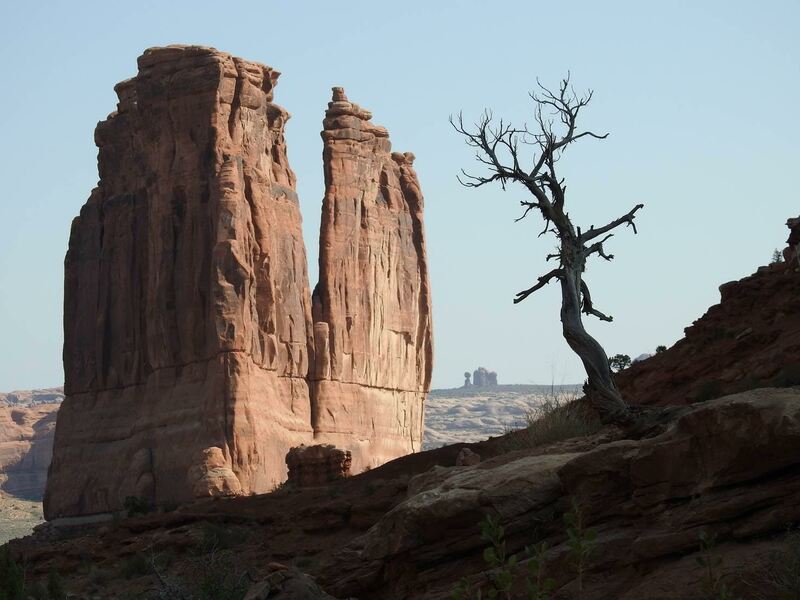 Humans have lived in the Arches area since the late Ice Age. First there were hunter gatherers. Then, early in the first century, came the farmers that we now call the Puebloans — the folks who also settled Hovenweep. The first Europeans who came through were the Spanish, who roamed their way through the west starting in the late 16th century. But the first recorded evidence of white visitors is from June 9, 1844 — the date carved by Denis Julien, a fur trapper and serial vandal, along with his name, into a rock in the area. In 1855, Mormons established a mission in what was eventually called Moab. They almost immediately abandoned the mission, after one too many attacks by the Utes, who were understandably annoyed that people were coming in and taking their land. White settlers came back permanently in 1878, lured by the discovery of precious metals and coal in the area. By then, the Utes were on their way to losing their war against and land to the US government. There are over 2000 arches in Arches and the main question for a visitor: which ones to see? We decided to drive to the end of the 18-mile scenic highway that winds through the park and work our way from top to bottom. 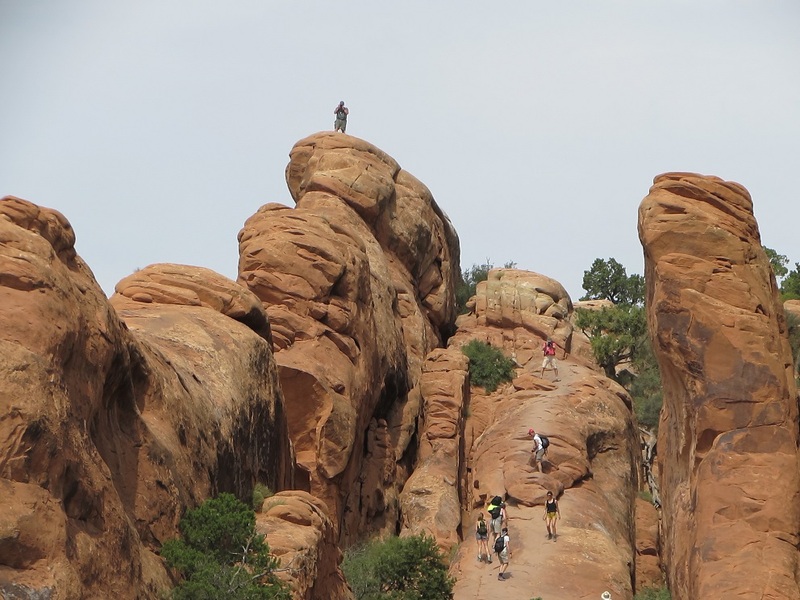 I wasn’t able to do any physically demanding hikes (I’ll get into that in a later post), so we chose arches that were accessible after a short walk. 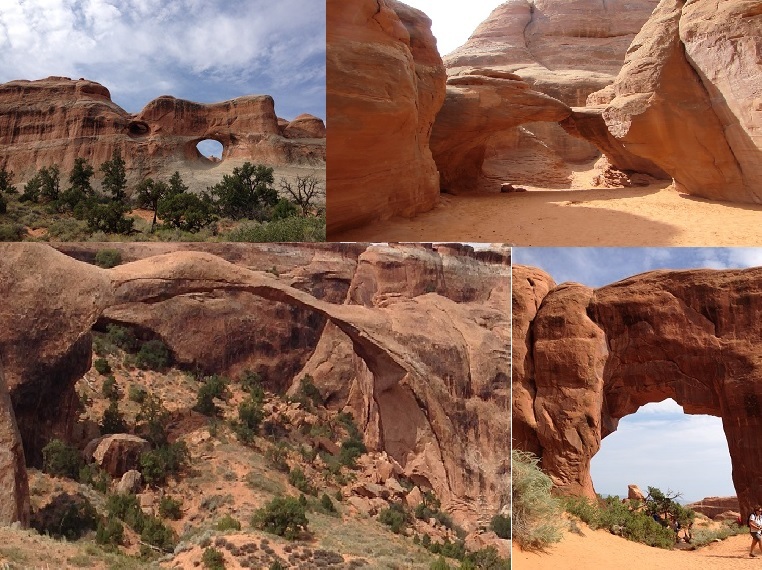 We went early and stayed until mid-afternoon (when the sun just got to be too much) and managed about 6 arches (a sampling, from top left clockwise: Tunnel Arch, Sand Dune Arch, Pine Tree Arch and Landscape Arch). We strung together about 5 miles of hiking altogether. What we loved about Arches — which turned out to be our favorite out of the 8 national parks we saw on this trip — was that it wasn’t only arches. There were slot canyons, like I’m going through above. And all manner of cool formations and hiking trails, as easy or as difficult as you would want. I opted out of climbing the trail in the photo below, but that’s Mr. History Tourist standing at the top, taking a photo of me taking a photo of him, while I waited under a shady overhang, about a quarter of a mile below. We gave Arches only a day and a half and that just wasn’t enough time to do all we wanted to do. 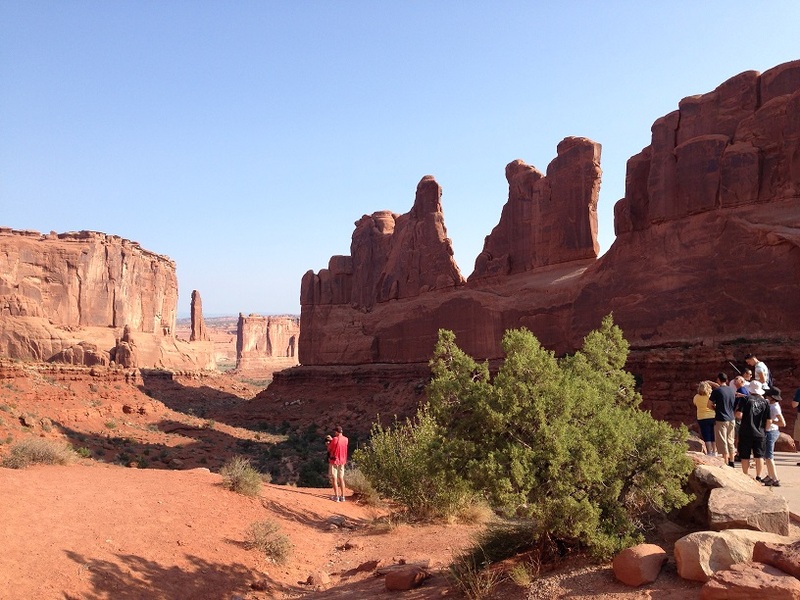 We didn’t see Delicate Arch, the most popular of Arches’ arches. Or Wolfe Ranch, a 100 acre plot settled by John Wesley Wolfe, a Civil War vet who moved from Ohio to Utah in search of a drier climate. But the point of our “if it’s Tuesday, it must be Zion” Utah road trip was to determine what we’d like, so that we can explore those sites further on a future trip. And Arches has the #1 spot on the return schedule. I loved that place when I visited in 1995. Thanks for the memory nudge. We loved it too. We knew it would be beautiful, but were genuinely surprised at how far it exceeded expectations. We can’t wait to go back. I just checked out your blog and it’s great — fun read and gorgeous photos. I’ll definitely be following it. Thanks for dropping by. Thanks pal! I look forward to your next writing 🙂 anything in the pipline atm?